Looking for the best Actron scanner? Then you are on the right page now. 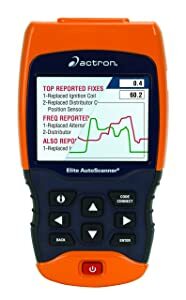 In the world of handheld vehicle scanners, Actron is a clear market leader. They produce a wide range of easy-to-use scanners targeted at all audiences. Whether you’re a car newbie who wants to figure out why his check engine light is on or an experienced mechanic who works on cars every day, Actron makes a scanner for you. In order to help you choose the right scanner, we’ve picked out 7 of the best models on the market right now. Our comprehensive reviews will give you all of the information you need to pick the best Actron scanner for your garage. The Actron CP9125 C PocketScan Code Reader is a compact, portable OBD-II scanner that’s perfect for simple fixes. It’s got everything you need to read and clear basic check-engine trouble codes in an incredibly tiny package. This Actron PocketScan is small and cheap. This makes it perfect for both professionals who need a diminutive scanner and regular people who want to save money on car maintenance. Despite its small size and low cost, it’s an invaluable tool when it comes to diagnosing and fixing many types of engine problems. Best of all, it’s fully compatible with virtually every vehicle made after 1996. Small – The CP9125 can easily fit in your pocket, literally. Fully Compatible – You don’t have to worry about make, model, or year. This PocketScan works with everything! 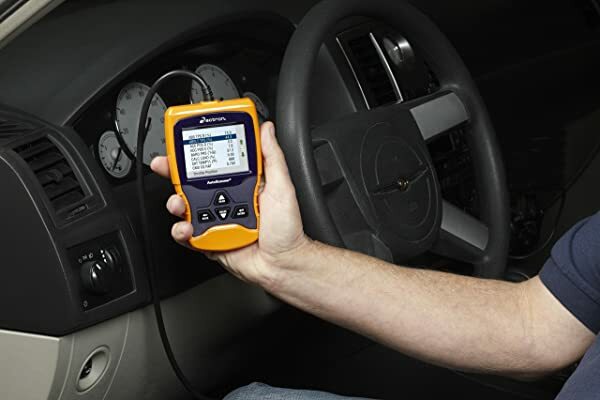 No Manufacturer Specific Info – Oil, brake, and airbag codes can’t be read or cleared with this scanner. Small Screen – Due to the small size of the CP9125, there’s not a lot of screen space. If you want a small, cheap scanner that you can fit in your pocket, the CP9125 PocketScan is a perfect choice. It offers full functionality when it comes to reading and clearing basic trouble codes and a few more features to boot. Whether you’re after a pocket scanner you can use at work or you need a cheap tool for your home garage, it’s a great choice. Actron’s CP9680 Autoscanner is a perfectly balanced scanner that’s great for professional use. The large color screen and enhanced functionality of the CP9680 are a serious upgrade over most everyday scan tools. This beefy device has enhanced compatibility with many makes and models of cars. If you want to read manufacturer-specific trouble codes on most cars built between 1996 and 2013 and view data on a big, bright screen, the CP9680 is a great choice. The Actron CP 9680 Autoscanner Plus is perfect for people who work with cars regularly. The trilingual menu, easy buttons, and enhanced features make it perfect for everyday use at an auto shop. It’s got advanced handling of live engine data and full compatibility with many manufacturer-specific error codes. This lets you quickly diagnose an engine problem in a Ford and then turn off an oil light on a Toyota without skipping a beat. Scan tools are notorious for only working with certain makes and models. The CP9680 isn’t the most expensive tool on the market, but it’s not the cheapest, either. Actron CP 9680 Autoscanner is a perfectly balanced scanner that’s great for professional use. It’s got a big screen and full functionality, including compatibility with manufacturer-specific codes from most makes. 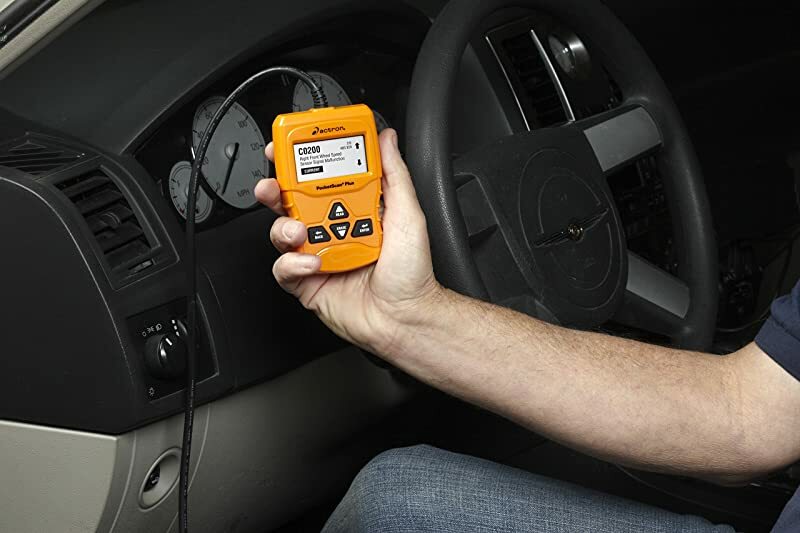 It’s an ideal tool for diagnosing a wide range of problems in a wide range of cars. The Actron CP9690 Autoscanner is the perfect choice for a mechanic who sees older cars regularly. If The Actron CP9680 Autoscanner above wasn’t universal enough for you, the Actron CP9690 Autoscanner is the tool you want. Not only does it come with a user interface in three languages, but there’s also an OBD-1 cable in the box. This lets you plug this scan tool into an even wider range of vehicles, including GM, Ford, and Toyota cars from 1984-1995. The inclusion of an OBD-1 cable makes this tool an even better choice for professionals. No matter what rolls into your shop, you’ll be able to serve it with the 9690. It’s also a great choice for people who want to do maintenance on their older vehicles at home, especially if they also have a newer car they want to service. Not only does the Actron CP9690 Autoscanner come with a user interface in three languages, but there’s also an OBD-1 cable in the box. The 9690 comes with an OBD-1 cable and can work with many common makes of cars manufactured between 1984 and 1995. The 9690 works great with modern cars, too. In fact, it’s got the same features and compatibility of the 9680 above. Like the other large Actron scanners, the 9690 has a simple button layout and a large LCD screen. It’s simple to pull live data and easy to interpret the results. With more than one cord in the box, it’s a bit easier to get lost with the 9690 than it is with other scanners. In a professional environment, however, this isn’t a big deal. The addition of extra features and extra cords means that this scanner is pricier than the 9680. Overall, the Actron CP9690 Autoscanner is the perfect choice for a mechanic who sees older cars regularly. The ability to easily service vehicles made between 1984 and 1995 will help you satisfy customers you wouldn’t be able to help with a normal scan tool. 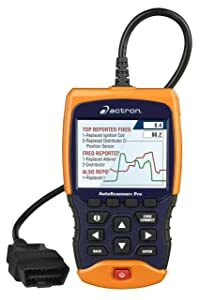 If you just want to figure out what’s wrong with your car, the Actron CP9670 Autoscanner is a more affordable choice than the beefy scanners above. While it can’t clear manufacturer-specific codes, the 9670 can still read plenty of information from your vehicle. It’s a great tool for home diagnostics or a great second tool for auto shops. 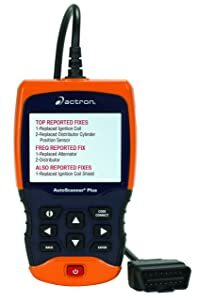 Since the Actron CP 9670 can’t clear oil, airbag, and other manufacturer specific codes, it’s not going to go over well as your only scan tool in an auto shop. Still, the large screen, great compatibility, and low price make it perfect as a backup. You can let one of your mechanics use this to diagnose a problem and then have another mechanic reset the light later with another tool. It’s also perfect for home use since the lower cost puts it well within reach of most households. The 9670 is quite affordable, despite the rich feature set. This makes it a perfect way to save money while diagnosing a car at home. Not only does the 9670 have a big screen and easy buttons, but it also automatically pulls basic data from your car. This makes it faster and easier to use than many competing scan tools. While you can’t reset an oil light, you can still read, record, and playback engine data with the 9670. You can also read and clear basic DTC codes and access some manufacturer specific information. Manufacturers use their own protocols for oil, brake, airbag, and other vehicle error codes. While the 9670 can read some of these, it can’t clear them all. You’ll need another tool to turn off some dashboard indicator lights. The low price of the CP9670 Autoscanner makes it the perfect Actron scanner for the home mechanic on a budget. It’s also a great backup for an auto shop that needs another diagnostic tool. With a big screen, a simple interface, and full diagnostic capabilities, it’ll help you solve all of your car problems in no time at all. 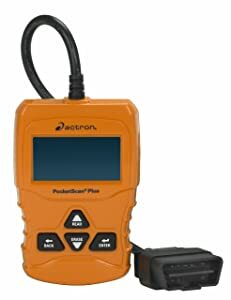 The Actron CP9660 PocketScan Plus is a powerful diagnostic tool in its own right, but more importantly, it’s cheap and easy to use. 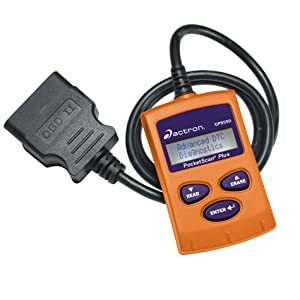 If you’re not interested in a color screen or fancy settings, the Actron CP9660 PocketScan Plus is a perfect way to figure out what’s wrong with your vehicle. Without a color screen, it’s a bit smaller than the 9670 above and arguably a bit harder to use. The low cost and small form factor of this scan tool make help distinguish it from the crowd. It’s got all of the features you need to diagnose basic engine problems yourself. Without the ability to clear manufacturer-specific DTC codes, the PocketScan Plus is clearly best for home use. It can still be used in the shop to read live engine data or clear OBD-II codes, but it’ll get outclassed by the larger scanners above when it comes to general professional use. As far as home use goes, however, the PocketScan Plus is perfect. It’s got everything you need to clear your check engine light at home while saving money. The CP9660 PocketScan Plus is a perfect way to turn off a check engine light. Read And Clears OBD-II Codes — OBD-II codes. If your check engine light is on, this tool can tell you why and then turn the light off. This tool doesn’t have a complicated set of menus or a big screen. Instead, it’s pocket-sized and very easy to use. If you need to clear an oil light, check your car’s battery, or diagnose a brake issue, this isn’t the tool for the job. Not only is the screen on this scan tool a bit on the small side, but it’s also black and white. This makes it somewhat harder to read. If all you want to do is turning off a check engine light, the CP9660 PocketScan Plus is a perfect way to do that. It’s a powerful diagnostic tool in its own right, but more importantly, it’s cheap and easy to use. Once you plug it into your car, it will only take a few minutes to read all of the available information and tell you what’s wrong. If you’re after a super small scanner, the Actron CP9550 PocketScan Plus is a great choice. The Actron CP9550 PocketScan Plus is an even smaller version of the PocketScan Plus above. By shrinking the screen and making the diagnostic computer as small as possible, Actron has managed to make a device you can easily fit into your pocket. Despite this, it’s got very similar functionality to the 9660 above. Truthfully, the 9550 is outclassed by the 9660 in most relevant ways. It’s a bit smaller, but it’s not necessarily any cheaper and offers basically identical functionality. This makes it a perfect Actron scanner for professionals who need the smallest tool possible. You’re better off choosing the scan tool above unless the 9550 is on a steep sale or you need a really small scanner. The Actron CP9550 PocketScan Plus is an even smaller version of the PocketScan Plus above. By shrinking the screen and making the diagnostic computer as small as possible, Actron has managed to make a device you can easily fit into your pocket. Tiny – The extra-small screen and the tiny internal computer make the 9550 one of the smallest scanners around. The 9660 offers pretty much everything that this tool offers and has a bigger screen. Unless this unit is on a steep sale, it’s probably better to get the 9660 instead. If you’re after a super small scanner, the Actron scanner CP9550 PocketScan Plus is a great choice. Otherwise, you should carefully consider your other options. You’ll probably find that this device is simply outclassed by the other Actron models on the market. 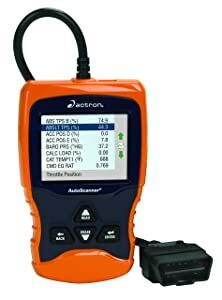 The Actron CP9695 is Actron’s ultimate diagnostic tool. With enhanced compatibility, updated software, and advanced diagnostic features, you’ll be able to solve almost any car problem with this device. The addition of BMW, Jaguar, Audi, and Mercedes to the list of compatible makes helps cement this tool as a great choice for automotive professionals. When coupled with the extensive CodeConnect software package, this compatibility enables you to diagnose complicated problems in just a few minutes. This makes this tool an ideal Actron scanner for the professional environment. It’s still a great choice for home use, too, although you might not make full use of all the features. The addition of BMW, Jaguar, Audi, and Mercedes to the list of compatible makes helps cement this tool as a great choice for automotive professionals. Not only can this tool read and clear all OBD-II DTCs, but it can also read and clear manufacturer specific DTCs from a wide range of popular makes. When you scan a code with this device, CodeConnect automatically gives you a list of the most common problems and fixes associated with that particular DTC. There’s nothing worse than having to stare at a tiny screen all day. The LCD in 9695 is big, bright, and clear. All of this functionality doesn’t come cheap. The 9695 is a fair bit more expensive than basic scanners like the 9670. If you just want to clear a single check engine code, you can save a bit of money by choosing a different scan tool. If your shop primarily deals in more modern cars, the 9695 is the most comprehensive choice. With expanded manufacturer-specific compatibility, a big screen, and a great software package, you’ll be able to diagnose most problems in most modern vehicles. If you see older vehicles often, however, consider the 9690 instead. Actron’s range of automotive scan tools covers just about every use case. If you want a cheap tool that can read engine information and clear basic trouble codes, the Actron CP9670 is probably the best choice. It’s got a color screen and a few extra features that can help you figure out what’s wrong with your car without spending a lot of money. If you’re a car professional, however, you should go with the CP9690 or the CP9695. Both of these tools can clear manufacturer-specific DTCs and access other advanced information, making your job a bit easier. 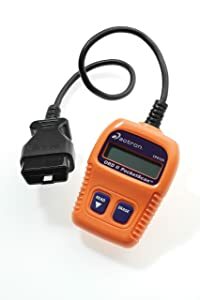 The CP 9690 Actron Scanner comes with an OBD-1 cable and can scan many cars made in the late 1980s and early 1990s before the OBD-2 port became standard. It’s the clear winner if you service a neighborhood with lots of older cars. The CP 9695 Actron Scanner is better if you see newer cars, with a few more features and slightly better compatibility with some makes. You’re not going to go wrong with any Actron that you choose. 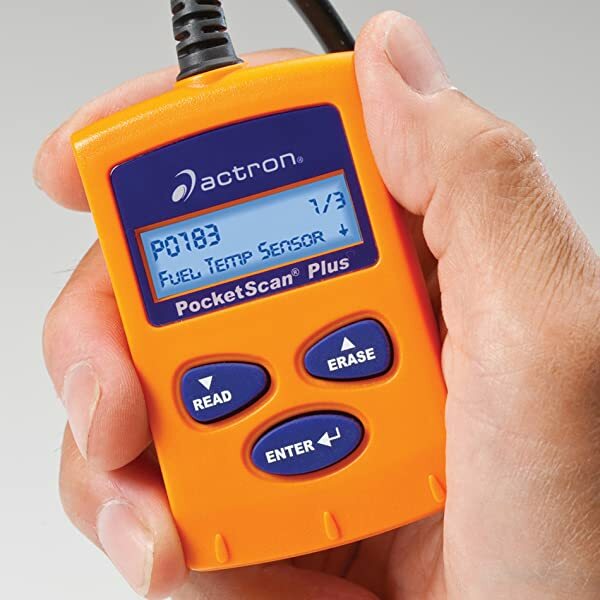 All of Actron’s scanners do a great job of reading engine data and clearing any trouble codes you come across. They’re simple to use and incredibly effective at helping you diagnose car problems in minutes. With a bit of experience, common sense, and hard work, you’ll be able to fix all of these problems with the aid of your Actron scan tool.